Two weekends ago, we celebrated Thanksgiving here in Canada. A wonderful dinner was had by all, and a TON of turkey and fixin’s were left over. We decided to save, one of the breasts and a leg, to make something else. 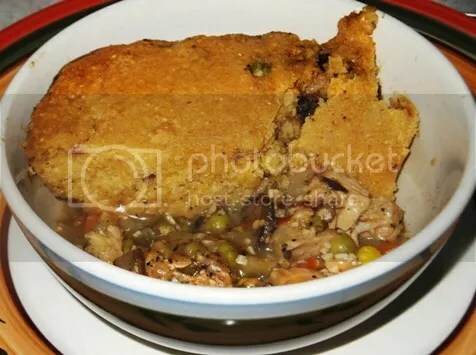 After perusing the interweebs, I came across this turkey pot pie recipe, that had a cornbread crust. I usually make pot pie with a flaky crust, but wanted to try cornbread, since I had a bag of Bob’s Red Mill Cornbread Mix. Next time I’ll make the cornbread from scratch, as is shown on the recipe itself though. I chose to use frozen veggies, consisting of carrots/corn/peas/green beans. I had leftover celery, and added mushrooms, because we love mushrooms. I chose to also use poultry seasoning instead of sage and thyme separately. It turned out pretty good too!! The only thing I’ll change for next time though, is I won’t pour the cornbread batter over the pot pie mixture, since it sopped up a lot of the liquid in the baking process. Next time, I’ll scoop the cornbread batter, on top of the mixture instead. I’d recommend this recipe, as a good basic one to make your own though!! The recipe below has been doubled, so if you want to make less, just adjust the measurements accordingly. To make filling: Preheat the oven to 400°F. Coat a pie plate (or any baking dish you like) generously with nonstick cooking spray. Heat olive oil in a large pan over medium heat. Add onion, carrots, celery, and green beans, and sauté for about 10 minutes, until tender. Add garlic and stir constantly for 30 seconds. Sprinkle the flour into the pan and stir until it coats the vegetables, about 30 seconds. Slowly stir in 2 cups of heated chicken or turkey stock, whisking well so that the flour begins to declump and thicken the stock. Cook mixture over medium heat until thickened and bubbly, about 4 minutes. Stir in turkey, thyme, sage, salt, and pepper. Pour the mixture into your prepared pie plate and spread mixture evenly. To make crust: In a large bowl, whisk the cornmeal, flour, baking powder, sugar and salt. Stir milk, egg and canola oil until well combined in a separate bowl. Stir wet ingredients into dry ingredients. Spoon the batter evenly over the filling. Bake until the top is golden brown, about 22 to 25 minutes. Let cool for at least 15 minutes before serving.